Brian Francisco | The Journal Gazette U.S. Sen. Joe Donnelly, D-Ind., spray-paints the batter’s boxes Tuesday before the TinCaps game at Parkview Field. 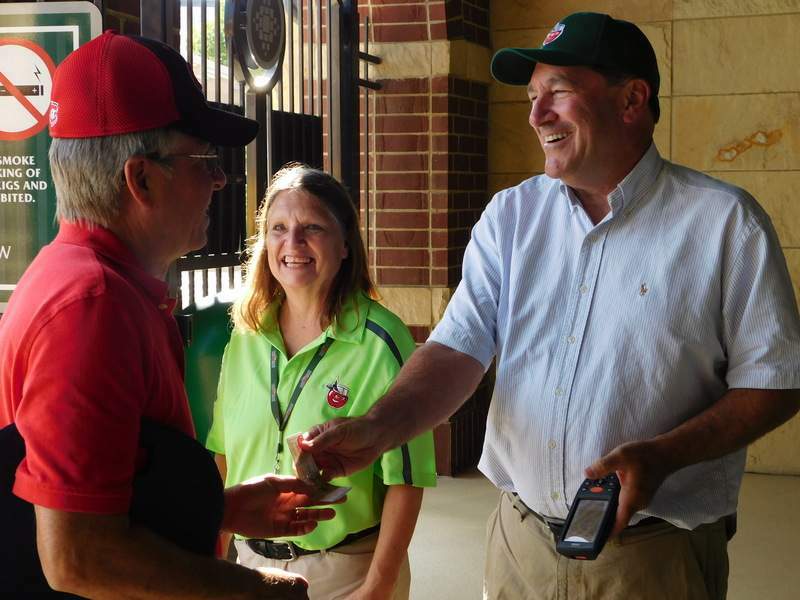 Brian Francisco | The Journal Gazette U.S. Sen. Joe Donnelly and Parkview Field employee Pat Evans scan a fan’s ticket to Tuesday’s TinCaps game. "You’re doing a great job," a TinCaps fan said as he walked past U.S. Sen. Joe Donnelly at the main gate of Parkview Field. "Thank you," replied Donnelly, D-Ind. The fan likely was remarking on Donnelly’s congressional performance – although he might have been lauding his prowess at scanning tickets for Tuesday’s game between the TinCaps and Lansing Lugnuts. For his latest "Donnelly Day," the senator also spray-painted batter’s boxes at home plate, threw out a ceremonial first pitch and was scheduled to work in a concessions stand and the broadcast booth. Donnelly Days are designed for him to work alongside people in a variety of jobs to get a better understanding of how Hoosiers make a living. On Monday, for instance, he worked at a Chesterton company that manufacturers food processing machinery. And last year, the Granger resident trained in water rescues with members of the Fort Wayne Fire Department. Donnelly seemed to prefer his duties at Parkview Field. "This is as good as it gets," he said between his chores. "To be here in Fort Wayne, such a great town, and to be at the ballpark – it’s like being in heaven to me. I love baseball. I’ve played for a lot of years." For several years, Donnelly has played first base for the Democrats in the annual Congressional Baseball Game at Nationals Park in Washington. He said Tuesday that he is still nursing an injury to the shoulder of his throwing arm that he suffered while making a fielding play in this year’s game against the Republicans in June. 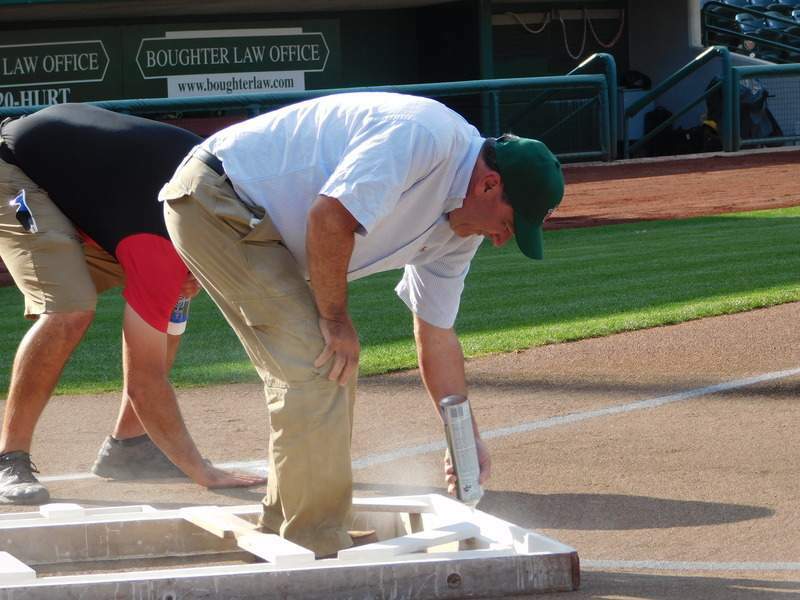 After painting the batter’s boxes, Donnelly marveled at Parkview Field’s playing surface. "You could eat off of that field, it’s so beautifully taken care of," he said.